Chicken soup is what mothers recommend, not to mention Jack Canfield and Mark Victor Hansen, each time you feel a little low — whether from a bout of flu or from the business of living. 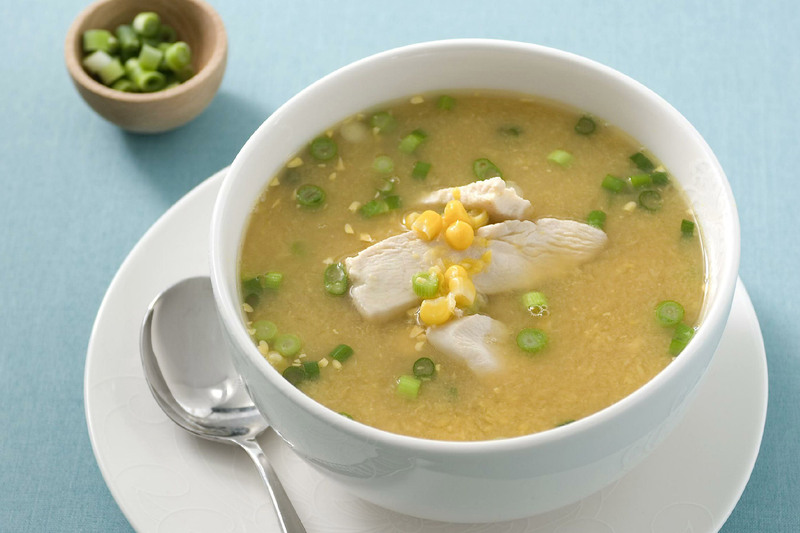 But my all-time favourite is a variation of it — a chicken sweet-corn soup, that staple of Indian-Chinese food across India. In fact, a visit to a “Chinese” or “Indian-Chinese” restaurant in the country is incomplete without someone at the table asking for a bowl of it. And there are versions like the crabmeat-corn soup, made in the same style, that can be quite wholesome too even though you have to take care that the restaurant is using fresh seafood, which can be something of a problem in Delhi. (Dining at a popular and not inexpensive restaurant in Noida, suburbian Delhi, at a restaurant called Fortune Cookie, recently, we had to send back our order of crabmeat soup because it was so smelly and vile tasting. The waiter said they were using canned crab though I would have checked the expiry on it! But back to the sweet corn soup: Contrary to what you may think, it is actually a legit Chinese preparation even though the way we drink it in India (highly seasoned with soya and chilli sauce, not to mention vinegar with bits of green chillies preserved in it) is a local innovation. There are plenty of recipes for it floating around, including in cookbooks by Tarla Dalal aimed at vegetarians only. But you can alter all these to suit your palate. What is really beautiful about the soup is not just its velvety, cornflour-acquired texture (nothing like starch to comfort the body and mind, after all) but also the ease with which it can assume Indian accents: Chop in a little coriander, be free with the chilli and soy sauces, replace canned corn with flavourful, fresh bhutta, available so easily and cheaply at all our streetsides, even stir in some chaat masala, and lo, the concoction gets transformed into something that will warm all hearts. While the chicken sweet-corn soup — and its variants – are commonplace, one of the most celebrated Chinese soups that you will come across only in posh establishments all over the world (and only rarely in India) is the Bird’s Nest Soup. Cave Swifts build salvia nests which dissolve in water to give a gelatinous texture. These are now commercially harvested—most notably in the limestone caves of Borneo; the import of these nests apparently accounts for .5 per cent of Indonesia’s economy!—and exported to countries like the US and Hong Kong, amongst the biggest importers. The nests have high levels of calcium, iron, potassium, and magnesium and the soup per se is accredited with benefits ranging from improving your voice to your libido. But it is one of the most expensive soups that you can taste around the world: In Hong Kong, a bowl of Bird’s Nest Soup would cost you about $ 30 to $100, according to Wikipedia. The Bird’s Nest soup has apparently been part of Chinese cooking for 400 years. But the history of soup goes back to the earliest times considering that boiling was the earliest of cooking methods. In Europe, in the medieval ages, soup was sold by street vendors and preferred for its curative and restorative powers. As such, it came to be called restaurer. In 1765, in Paris, a shop opened specialising in restaurers—which prompted the use of the word “restaurant” for shops selling food. French cooking terms are elaborate, precise and known to confuse many. But don’t be intimidated next time you confront the words consomme or bouillon on the menu. The latter is just broth and thus connotes a rustic or home-style concoction. Consomme, on the other hand, is a more refined version where the soup is first strained. Then, there are bisques; thick and creamy and classically made from pureed seafood. The most famous French “soup”, of course, is the Bouillabaisse, the fish soup from Marseille, a wholesome meal traditionally for the fishermen. Bits of fish—all kinds, including shellfish —are added to make this. Other notable seafood soups that you may like to make your acquaintance with are the Soupe de Moules from Antwerp, with mussels, and Boston’s Clam Chowder. Tomato is another popular ingredient for soup. In India— a land where we have dals and curries but few soups intrinsic to our cuisines —we have the rasam as well as the sar (thin tomato soup with coconut milk in Maharashtra), as well as ketchup-y concoctions regularly turned in by restaurant chefs. But one soup that you have to sample if you are a “tomato person” is the gazpacho. Few Indians like cold soups, but try a cold gazpacho, a Mediterranean summer staple, full of the aromas of fresh vegetables and ripe tomatoes, and you will come away truly refreshed. Then, there are others in the cold category including beetroot soup that can be served prettily in shot glasses as an appetizer. Clearly, when it comes to satisfying meals, there is enough even for Oliver Twist. Make the soup by boiling the stock with the chicken and adding the corn to it. Thicken with cornflour dissolved in water. Add the chopped coriander and the sauces. You can also break an egg into it and let the strands float. Drink hot.